My initial reaction when I span this disc: Dream Theater is back! Quality-wise they are back. I was losing a bit of faith with their latest albums. Train of Thought had minimal effort on songwriting [the album was finished in two weeks] and focused on showing off, with Ruddess using awful keyboard sound selections. Octavarium was too varied for its own good, was not complex enough, and had some plagiarism problems. This album, while its sound stays true to those two uneven albums, the songwriting is better and borrows elements in their earlier albums: complexity and melody. This is probably the first album since Images and Words where the instrumental sections and solos generally compliment the compositions and are not there for the sake of showing off and providing entertainment. Unfortunately, it's not an improvement in every way because the lyrics are usually laughably bad and very embarrasing except a couple of songs. The album starts with the first part of In The Presence of Enemies which initiates with heavy soloing. I think it starts very awkward and abrupt as it could have used some sort of build up. The heavy instrumental introduction is five minutes long, but after the first or second minute I can get into it regardless of its awkward beginning. It features a beautiful guitar melody and some extremely complicated arrangements. The second half of this opening song features an improved James Labrie, who seems to have finally recovered from his vocal chord rupture a decade ago. Forsaken is a very radio-friendly track with piano-work that reminds of Evanescence, simple yet effective guitar riffs and memorable melodies by Labrie. Why this wasn't the single of the album is beyond me. However, why is Dream Theater singing about vampires?? Constant Change and The Dark Eternal Night are the two heavy "Train of Thought" kind of tracks that are a bit weak on melody. "Constant Change" is the single and sounds like Metallica with keyboards. Vocals are somewhat annoying in the verses but fortunately Petrucci lets go a great solo here. "Dark Eternal Night" has even more embarrassing lyrics about a mummy? The song starts great with a nice trashy riff but the processed vocals screaming "No one DARES TO ... SPEAK of the terrible DANGER!!!". It's just cheesy beyond imagination with only melody in the pre-chorus and chorus which are good if you ignore the lyrics. The instrumental section is just hilarious, what on earth are they doing? It sounds like circus music in odd time signatures. It is still entertaining in the same way an awful B-side movie is. Fortunately, those two heavy songs are redeemed by the excellent second half of the album. Repetance is the continuation of the Alcoholic Anonymous suite. this song is surprisingly an extended ballad, and easily my favorite of the AA songs yet. It starts with a familiar guitar line and a processed vocal from what appears to be Steven Wilson himself. The first half is a very melodic and moody composition that is heavily influenced by Porcupine Tree and Opeth's Damnation era due to the guitar sounds, composition and arrangement-style, and the use of the mellotron. One of Petrucci's finest and most melodic solos lead into the second half of the song that has voices from famous musicians and build up into an unexpected coda with "ahhh" vocal harmonies, fat riffs, a growling bass, and eventually more voices. It could have been a bit shorter, but it's still a magnificent and surprisingly stripped down track. Prophets of War starts electronically in a way that reminds me of Ayreon until a driving and memorable guitar line breaks it into a chorus, which later contain crowd chants and war cries. 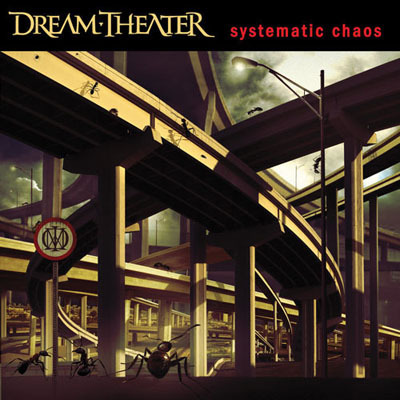 This song is an attack on the Iraq War, which I agree with the views of Dream Theater once again [Their previous "In the Name of God" was spot on]. This, along with Forsaken, could have been the single as they are both catchy and accessible and Prophets of War even has a rapping section. The Ministry of Lost Souls is for me the highlight of the album and among Dream Theater's greatest musical achievements. It is a trip back to Scenes from a Memory's best moments. The first section of the song is reminiscent of "The Spirit Carries On" with soaring guitars, Ruddess tasteful playing, and Labrie being at his most emotional. The beginning of the instrumental section is so dramatic that I love it. It quickly turns into heavy metal for a couple of minutes and then James Labrie has a short moment to sing again in a symphonic ballad section and a brilliant guitar line finishes the piece. In The Presence of Enemies resumes with embarrasing lyrics "Dark Master I will Fight for you", but musically speaking, it is better than the Octavarium epic. This epic has elements of almost all the tracks in the album except for tracks #3,4, contains a long and complex instrumental section that has an excellent mini moog solo that brings back the excellent melody in the beginning of the first part of this epic. The song finishes off in a similar style of Octavarium: symphonic and majestic. Overall, this is an excellent album by both beginners and fans of Dream Theater. It summarizes everything that is Dream Theater and partially brings them back to their past where their instrumental noodling was not so excessive.